1 of 4 Heat 2 teaspoons of the oil in a large skillet over medium-high heat. Add the Canadian bacon; saute for 3 minutes. Add the red onion and remaining 1 teaspoon oil; reduce the heat to medium; cook, stirring frequently, for 5 minutes or until the onion is softened. 2 of 4 Add tomatoes, tomato sauce, balsamic vinegar, 1/2 teaspoon salt and the pepper. Reduce heat to low; simmer 15 to 20 minutes or until thickened. 3 of 4 Meanwhile, in a bowl stir together ricotta cheese, remaining 1/4 teaspoon salt, Parmesan cheese and the chopped basil. 4 of 4 Once thickened, remove the tomato sauce from heat. Stir 1 cup tomato sauce into the ricotta mixture. 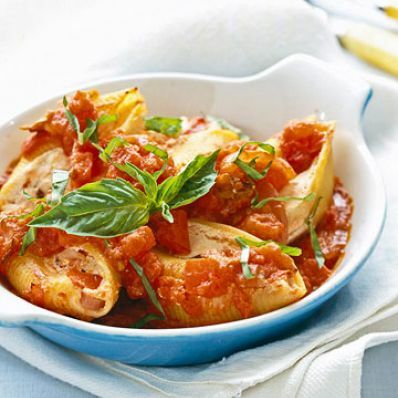 Use the ricotta mixture for the filling and the tomato mixture as the sauce for topping.